With 2019 still fresh from its birth, I’ve been taking the quiet moments of this month to consider what the United Methodist Church can offer our nation in these fraught times. I had lunch with a colleague this past week. We are part of a monthly gathering of United Methodist clergy who meet for conversation and peer support. This time round only two of us could keep the date. We sat across from one another at the table, with his tidy tuna fish sandwich and my fried flounder smothered in slaw, a tomato and tartar sauce. Evidently we both like fish, though he looked at the mess on my plate and soured to what I did with it. I’ve experienced this disapproval before, but it has never changed my palate. On the contrary, I prove myself and eat with gusto. It is delicious. And so went our conversation. We quickly discovered that our theological palates are comparably different. 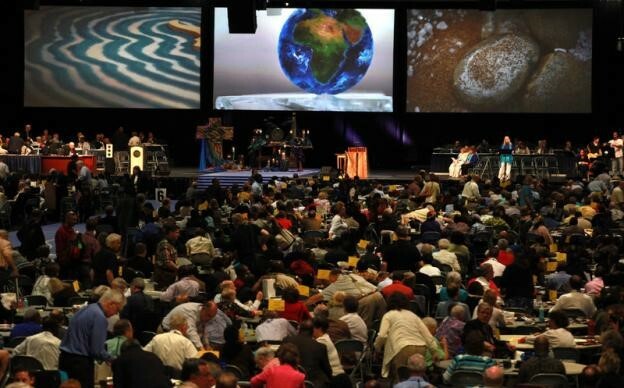 The thought on every Methodist clergy person’s mind these days is the General Conference to be held in mid-February. Teachings on human sexuality and gender roles have always been problematic for the church. The later epistles in the New Testament advised that women remain silent in the church, but on the day of Pentecost when the Holy Spirit caught fire, Peter addressed the crowd and declared that our daughters would prophesy. As to the beginnings of the Methodist movement, when Samuel Wesley left town for an extended period his wife Susanna, John’s mother, took over parish life and began to lead prayer groups. Her leadership caused a hullabaloo; and yet, so many attended that there was no room left in her house. Folks outside were shouting petitions through open windows. In our time, the disagreement has evolved but the topic is basically the same: human sexuality and where men and women of faith fit into the life of the church. My lunch partner and I were of different convictions, and for a moment I sensed in myself and sensed from him that perhaps we would have had a better day had we not showed up for lunch. To extend the analogy, no matter what I said, he was not going to be enticed to eat the fish on my plate, and tuna on white bread has never whet my appetite. Our minds were set. But we stuck it out. We had to; we are in covenant with one another. I hold his years of service to the United Methodist Church in deep regard, and he mine. In time we turned the conversation to other topics, such as how our congregations could work together to provide shelter for our poorest neighbors when the winter nights turn cold. Before we went our separate ways, we stood at the cash register and tussled over who would pay the bill. “Let me pick up the tab” he said. With the nation deep in bitter partisan conflict and caught up in fuming gaps between rich and poor, big city and rural life, the country’s largest mainline denomination has the opportunity to be a witness. Will we be a people willing to remain at the table? The nation will be watching. Come and sit with me at the table.